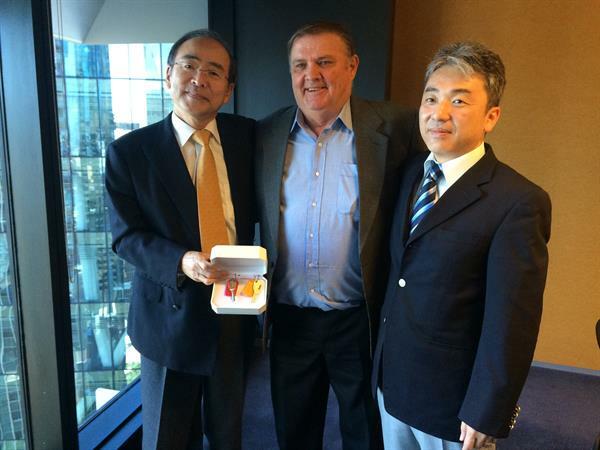 ABOVE: Yoshiyuki Fujimoto – Satake Corporation – Head of Operational Audit Office, and Yoshiyuki Katsura – Satake Corporation Department Manager – Overseas Management Department International, celebrating the transaction with Bob Denny. Craig Doorey, Director of Satake Australia, shares his thoughts on the challenges and opportunities offered by Satake's purchase of Denny's Silo and Engineering, and his experience of the sale process from the buyer’s point of view. Q. What are Satake’s core functions in Australia? Craig – We’re unique compared to other Satake businesses around the world because of Australia’s relatively small market. Satake generally engineers machinery for flour milling, colour sorting and rice processing. In Australia we do those things, plus we’ve diversified into feed milling, seed cleaning and materials handling. We manufacture equipment here, plus we also bring it in from other Satake groups and other companies around the world and distribute it. ABOVE: A screenshot from the Satake Australia website, showing just some of the industries the business is involved with. Q. What prompted you to approach Denny’s Silos about purchasing the business? Craig – Almost two years ago our parent company in Japan asked us to expand our business. In researching opportunities we looked at pursuing a business that complemented ours. On larger jobs we typically provide the middle part of a job – the processing and possibly the handling equipment – while a silo business does the front and back end of the job, providing storage for raw materials and end product. Q. What were some of the attributes that appealed to you about Denny’s? Craig – We had worked with them on numerous jobs in the last five years or so and a couple of those were quite significant. We got to see their storage and handling gear close up and it was extremely robust. In fact I had often looked at their equipment and thought ‘I wish we could build gear like that’. We had dealt with other silo companies around Australia and we considered Denny’s as number two or three in the industry. The larger companies were too big for us to manage. We wanted something of a similar size to us that we could develop and grow together. They also have a loyal customer base, which is both an opportunity and a challenge. Denny’s is a family owned business that has been operating for nearly 60 years and customers may see us as ‘outsiders’ from Japan, even though there are no Japanese staff working in Satake Australia. Q. How do you plan to marry the different cultures of a small, regionally-based family business and a multinational corporation? Craig – Denny’s has a regional, family culture which is a little difficult to marry with a corporate culture, and even trickier once you add the Japanese element. I’ve been with Satake 20 years and I enjoy the cultural differences but I admit it is a challenge sometimes, because Japanese people and Australian people simply have different approaches to business – the Japanese style is more formal. Denny’s is very much a family business, and it’s also a country business. It’s been successfully run their way for many years so it’s going to be a challenge for them to adapt to a more corporate business style. Q. What do you see as the major challenges of bringing the businesses together? Craig – Assuring customers that they’re still dealing with an Australian company, is one. We’re also trying to slow down the process of change to make it easier for the Denny’s staff and take the pressure off them. We don't want to lose staff because we’ve pushed too hard. They can’t change overnight from a family business to a large corporation. We’ve also taken over while Denny’s is experiencing a boom in demand and are working to capacity. We can’t let our sales staff rush out and start selling hard, because Denny’s has no capacity to make what we could sell. We’re having to slow down and stabilise the situation. Q. What do you see as the major opportunities of bringing the businesses together? Craig – I see huge opportunities over the next five to 10 years as we will be able to offer the complete grain storage, handling and processing package to customers. In the past when a client asked us to quote on providing the whole package for a greenfield site, we would provide the middle part and we would have to go to silo companies to provide the front and back ends of the job. When the silo companies quoted, we would then add a certain amount for contingencies to protect ourselves, plus a margin, and we would end up pricing ourselves out of the job. We have also been up against international companies that are entering the Australian market with imported product and beating us on price. Now we can offer the complete package, which features very strong equipment built in Australia for Australian industry. We can offer a competitive package to the client and utilise both Denny’s and Satake’s resources and grow both businesses. There will also be export opportunities. We’ve slowed down that development because we don’t want to push Denny’s too hard, but in the next three to five years I see exports progressing. Satake Australia services New Zealand and the Pacific Islands, so we want to get Denny’s supplying into those areas and then grow it out to Asia. We want to grow but it has to be one step at a time. Q. Why did you engage JPAbusiness to help with the business purchase process? Craig – I looked at a few consultants on the internet and invited three to provide quotes and meet with me. James came across as the one with the most understanding of our industry. He’s from the country and has worked in our industry. The others didn’t give us confidence that they understood what we did, or what we were trying to buy, but James did. I’m glad we did choose him because Denny’s were also happy with him. He was working for Satake as our consultant, but he also had to engage with Denny’s as well and he did that successfully. Q. What specific services did you need JPAbusiness to perform and what value did this add? Craig – JPAbusiness provided initial due diligence, then detailed due diligence once we got a Heads of Agreement. They took care of the detailed due diligence work up to the legal and tax sections, when Japan took over because they wanted Japanese-speaking consultants for that last part. I would have been happy for James and the JPAbusiness team to do the lot and I think it would have worked out well if they did. I had never been involved in buying a business before, but James made the process easy – he walked us through it. For example, at the start I was doing lots of research and coming up with questions for James, and he was answering them before I could even ask them. He would say ‘you have hired me to help you, so don’t worry about that – I’ll do it’. It took a lot of the worry out of it and that’s what you pay for. As a manager I’m slowly learning that you can’t do it all yourself and there are points where you need to get consultants in. Q. Why is it important to have support in the business sale negotiation process? Craig – James could ask questions I would have felt uncomfortable asking. This meant if Bob or any of the Denny’s team weren’t happy about the question they were unhappy with the consultant, not necessarily with me and Satake. Q. In your opinion, what were the main factors that made the transaction successful? Craig – The whole process was easy, yet very professional, and I think that’s because we got the initial due diligence right. We were able to tick off all the boxes that indicated Denny’s was the right business to buy and we answered all the questions Japan had. The initial due diligence period took a long time – eight months before Japan gave us the go-ahead – but that initial period was the most important. Once we entered the detailed due diligence period the answers were already ticked off. It was just a matter of going back through the information and making sure the ticks were correct. Denny’s didn't have the information at hand, or formal reporting structures in place, so that made it difficult and time-consuming but James just pressed on. He was very polite and very professional in the way he gathered the information – he doesn’t come out with a big stick – but he just kept pressing on until the information was provided.